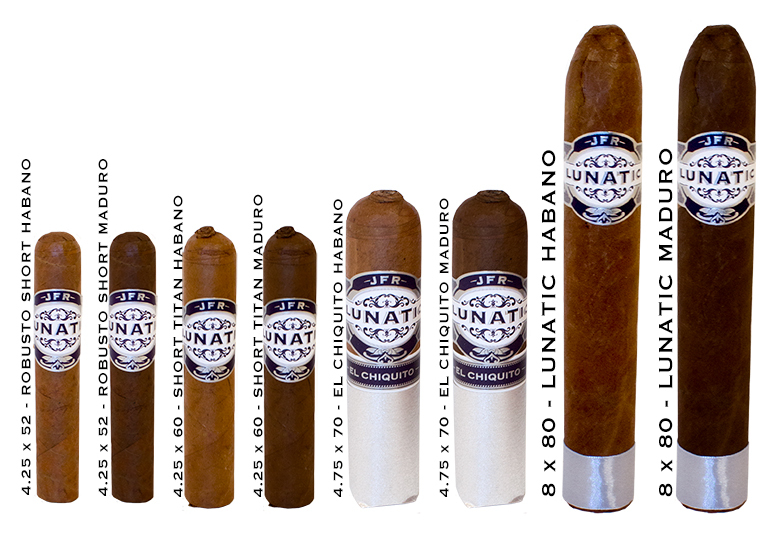 JFR Lunatic Cigars - Buy Premium Cigars Online From 2 Guys Cigars . The JFR Lunatic comes to us from Casa Fernandez the home of Aganorsa tobacco. It's a cigar that carries a wallet friendly price with ultra premium value. The Belicoso measures 8 x 80 and is one of the heaviest cigars in terms of weight you will ever come across. The Habano line features a wrapper from Ecuador while the maduro is wrapped in Mexican San Andres. From a traditional 52 ring up the the lunacy of an 80 ring guague this line is sure to please! Are you Lunatic enough to indulge?